The International Academy of Astronautics (IAA) is presenting an award to a pioneering team of scientists and engineers who combined an orbiting radio-astronomy satellite with ground-based radio telescopes around the world to produce a "virtual telescope" nearly three times the size of the Earth. The team, which includes two scientists from the National Radio Astronomy Observatory (NRAO), will receive the award in a ceremony Sunday, October 16, in Fukuoka, Japan. observatories together making "virtual telescope"
(blue) about three times the size of Earth. The IAA chose the VLBI Space Observatory Program (VSOP), an international collaboration, to receive its 2005 Laurels for Team Achievement Award, which recognizes "extraordinary performance and achievement by a team of scientists, engineers and managers in the field of Astronautics to foster its peaceful and international use." VSOP team members named in the IAA award include NRAO astronomers Edward Fomalont, of Charlottesville, Virginia, and Jonathan Romney, of Socorro, New Mexico. "This is a well-deserved award for an international team whose hard work produced a scientific milestone that yielded impressive results and provides a foundation for more advances in the future," said Dr. Fred K.Y Lo, NRAO Director. The VSOP program used a Japanese satellite, HALCA (Highly Advanced Laboratory for Communications and Astronomy), that included an 8-meter (26-foot) radio telescope. HALCA was launched in 1997 and made astronomical observations in conjunction with ground-based radio telescopes from 14 countries. Five tracking stations, including one at NRAO's Green Bank, West Virginia, facility, received data from HALCA which later was combined with data from the ground-based telescopes to produce images more detailed than those that could have been made by ground-based systems alone. 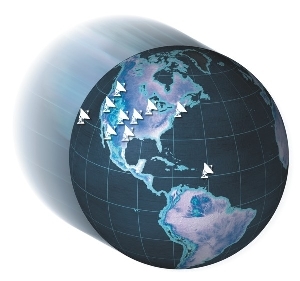 The NRAO's Very Long Baseline Array (VLBA), a continent-wide system of radio telescopes ranging from Hawaii to the Caribbean, was one of the principal ground-based networks working with HALCA. The VLBA's powerful special-purpose computer, called a correlator, was a prime workhorse for processing the data from VSOP astronomical observations. Very long baseline interferometry (VLBI) is a technique used by radio astronomers to electronically link widely separated radio telescopes together so they work as if they were a single instrument with extraordinarily sharp "vision," or resolving power. The wider the distance, or "baselines" between telescopes, the greater the resolving power. The IAA award citation notes that the VSOP team "realized the long-held dream of radio astronomers to extend those baselines into space, by observing celestial radio sources with the HALCA satellite, supported by a dedicated network of tracking stations, and arrays of ground radio telescopes from around the world." The VSOP team was able to approximately triple the resolving power available with only ground-based telescopes. The first experiment in such space-ground observation was made in 1986, using a NASA Tracking and Data Relay Satellite. The VSOP project grew as an international effort after that experiment, and provided observing time to astronomers from around the world. During the VSOP observational program, the combined space-ground system made more than 780 individual astronomical observations and also made an all-sky survey of the cores of active galaxies. In addition to providing large amounts of observing time on the VLBA and building and operating the Green Bank tracking station, NRAO staff also modified existing hardware and software and aided astronomers from around the world in analyzing VSOP data. On behalf of the entire VSOP Team, the IAA highlighted "the astronomers and engineers who made key contributions to realizing, and operating, a radio telescope bigger than the Earth." In addition to Fomalont and Romney, they are: Hisashi Hirabayashi, of the Institute of Space and Astronautical Science and Japan Aerospace Exploration Agency (ISAS/JAXA), Haruto Hirosawa (ISAS/JAXA), Peter Dewdney of Canada's Dominion Radio Astrophysical Observatory, Leonid Gurvits of the Joint Institute for VLBI in Europe (JIVE, The Netherlands), Makoto Inoue of the National Astronomical Observatory of Japan (NAOJ), David Jauncey of the Australia Telescope National Facility, Noriyuki Kawaguchi (NAOJ), Hideyuki Kobayashi (NAOJ), Kazuo Miyoshi (Mitsubishi Electric Corporation, Japan), Yasuhiro Murata (ISAS/JAXA), Takeshi Orii (NEC, Japan) Robert Preston of NASA's Jet Propulsion Laboratory (JPL), and Joel Smith (JPL). The International Academy of Astronautics was founded in August 1960 in Stockholm, Sweden, during the 11th International Astronautical Congress. The Academy aims to foster the development of astronautics for peaceful purposes; recognize individuals who have distinguished themselves in a related branch of science or technology; provide a program through which members may contribute to international endeavours; cooperation in the advancement of aerospace science. Previous recipients of the Laurels for Team Achievement Award are the Russian Mir Space Station Team (2001), the U.S. Space Shuttle Team (2002), the Solar and Heliospheric Observatory (SOHO) Team (2003), and the Hubble Space Telescope Team (2004).